Internationally acclaimed headshot photographer Laurens Antoine brings editorial style headshots to San Diego. Your headshot photographer should have experience. Being talented taking headshots isn’t enough. A seasoned headshot photographer knows how to send the right message. Pretty pictures alone won’t do it! A big well equipped studio with proper lighting is essential for any headshot photographer to have. Separate location equipment and lighting is important too. There are natural skills needed to. Good composition is an important skill for any headshot photographer. 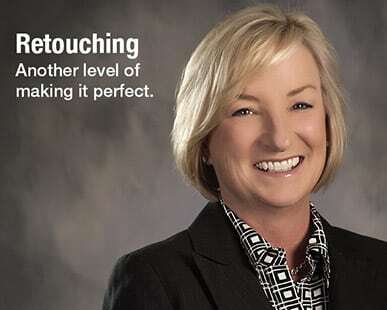 There are many ways to retouch headshots. You don’t want to have glowing skin like a glamour shot, nor do you want that cheap plastic looking skin tone unexperienced headshot photographers so often put out. 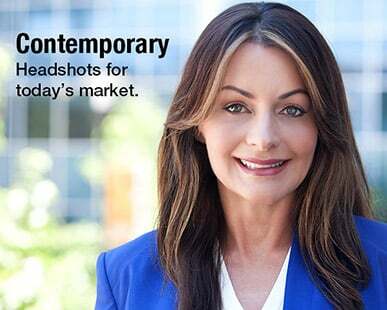 See who your headshot photographer has shot. That can be very telling! Now over 450 5 Star Reviews! 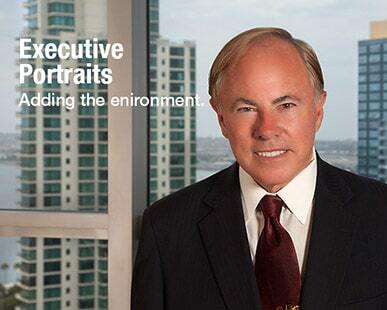 Learn about San Diego’s most reviewed and highest rated headshot. We’ll make you look your best. We provide the highest level of customer service. We offer competitive group pricing. See our 3000 foot state of the art studio. Finally, a solution for people not photogenic. No posing, no smiling. Yet look at our headshots. 20+ years of national editorial experience. You benefit from the same methods celebrities do. Over 450 5 Star Reviews and testimonials. The highest rated, most reviewed studio in California. 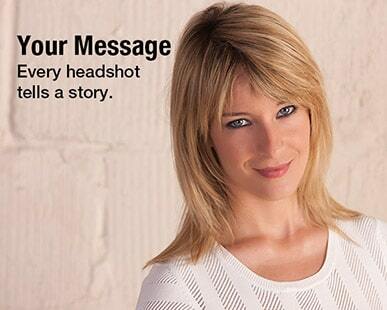 Good or bad, your headshot sends a message. We make sure you are conveying what you want your audience to hear. Trustworthiness, professionalism, and approachability are popularly used adjectives. But each headshot is crafted for your unique message. A natural pose or smile is challenging for even seasoned models. So why does everyone look so comortable and confident in our headshots? We’ve developed a simple method where you do practically nothing. It’s commonly related to as just talking to a friend. Gone are the days of cloud patterns and background lighting effects. Even colored backgrounds are considered tired now. We keep things clean and simple where the focus is on you. When people see your headshot they’ll know it’s recent, and appropriate for the time. Bad lighting can make your face appear flat, and boring. Dynamic lighting brings out your best, while helping cover your worst features. 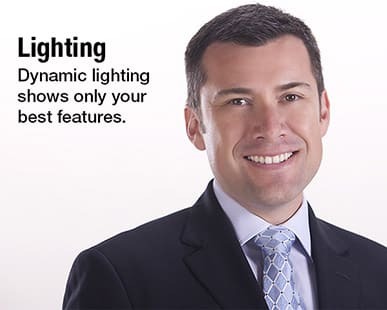 Our Modern Headshots benefit from up to 9 lights. Each light is modified to scuplt your face, and accent you best. Layer Blending Technology retouching (LBT) was developed in NY for glossy magazines. It’s used on every Modern Headshot. The process is unique as is preserves the real you, while diminishing things you really don’t want to advertise. Think back to the last headshot you got. Did you have fun figuring out how to use it online, for social media, directories and the other uses you may have wanted? Every Modern Headshot is delivered in 3 formats so you can readily use them as ndded. Even one ready for Linkedin. 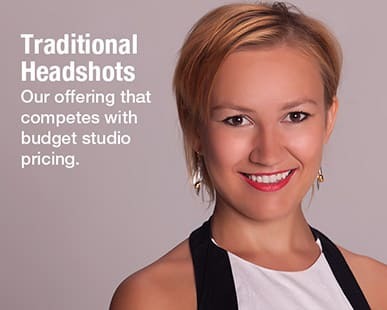 Traditional Headshots are competitively priced with those you’ll find at the budget studios, without the budget photographer. We’ll put these up against anyone else’s top headshot offering! A headshot made expressly for social media. If you are just looking for a low resolution headshot for Linkedin etc., we offer a cost effecient, ready to upload solution for you. 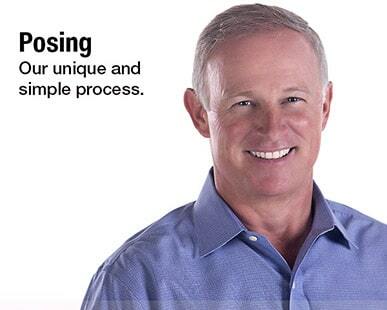 In some applications you want a headshot that tells more of a story than just about you. Our Executive Portraits can be shot almost anywhere. Over 450 5 Star Reviews and Testimonials! The highest rated headshot in San Diego all of California. Read the Most Recent Reviews Below | Google Us for 100s More! Im someone that hates pictures being taken of me, dont know if you can relate. For those of you that are like me, I'm telling you hands down this is who you want to photograph with. Laurens is great and so is the rest of his team. He gets you pics you will like. Can't say enough about my experience today. Can't wait to get my next shots done! Laurens was very easy to work with. He made me feel comfortable, and the entire shoot was incredibly efficient. I'm happy with the headshot, and would definitely recommend. Awesome turnaround with a great product. Top to bottom, a great experience. Everyone was courteous and very professional. The PICs are XCLNT as well! Easily worth the $$. Great studio with an ultra laid back downtown vibe where parking isn't an issue. Laurens was great to work with, a true professional, and funny dude. I was amazed at how quickly they were able to turnaround our team's headshots. Everyone looked great! We can't thank Laurens and his staff enough for the wonderful work they did! Our office staff needed updated head shots for our website and marketing materials. Seeing as we are all "Business Professionals" and not models by any means, Laurens worked his magic to make us feel comfortable and have a good time. My favorite part about his work is that it is important to him to catch natural smiles and edits the pictures so you look like you, but the best version of you. I also LOVE that his communication is on point from the first phone call, to the very last email and edit. No hunting down this fellow at all. All and all, we couldn't be happier with the results and the unexpected "Team Building" time it created for our staff. Very prompt, professional and easy to work with. Convenient location as well. Quality was outstanding! Highly recommend to anyone. Had a great experience with Laurens Antoine photography in getting my headshot updated. Scheduling was prompt and they sent advance information about how to prepare. Location is convenient (East Village, easy on and off the 163 freeway). The actual shoot was relaxed but professional. Final photos were turned around same day and came out fantastic. You get what you pay for and I can highly recommend Laurens Antoine if you need a professional headshot. Great, friendly and very professional photography studio. Took excellent headshots for our corporate website. An excellent experience all round. I had the absolute privilege of working with Laurens and his team this past week to shoot photos for my business launch. As someone who doesn't take photos for a living, Laurens made it incredibly easy and captured exactly what I was looking for. I will highly recommend him to all my clients going forward. You will not be disappointed! Laurens is great to work with. He (and his assistant Tori) made it easy for me to relax and feel comfortable. They were extremely professional and down to earth at the same time. Working with them to get my corporate headshot was a great experience. The images are fabulous. Super thankful I found Laurens and he and his staff were able to schedule me so quickly. Thank you! Laurens was outstanding from my first interaction with him via email. He was quick to respond and immediately went to work getting me scheduled right away. He even rescheduled me and helped me book hair and makeup right there at the studio. On the day of the shoot, I was warmly welcomed into the studio and truly enjoyed the company while Monica fixed me up for the shoot. I am a person who does not like having my picture taken but this group made it a fun and easy experience. Laurens and his assistant Tori didn't give up until we found something we liked. After the fact, his retouching is outstanding. He has a great eye for what looks best and takes his time to be sure you are happy with the final product. The result is a top quality photo.The price is a great value for the treatment and experience of the shoot. I would recommend this crew to anyone looking for a great head shot. BOOK HERE or CONTACT US WITH QUESTIONS!